1 of 1 Bring a pot of salted water to a boil, stir in ziti and cook 9 minutes. Drain. Meanwhile, heat 1 tbsp oil in a large skillet over medium-high. Add shrimp and cook 2 minutes. Remove with a slotted spoon. Reduce heat to medium and add 1 tbsp oil. Saute onion and garlic for 3 minutes. Stir in red peppers and stock. Bring to a simmer. Carefully transfer to a blender and process until smooth. Return to pan, stir in shrimp, cream, salt and pepper. 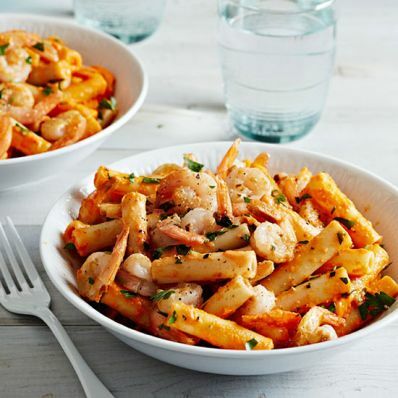 Bring to a simmer and cook 1 minute, then stir in cooked ziti and parsley. Per Serving: 4 g fiber, 24 g pro., 11 g Fat, total, 64 g carb., 460 kcal cal.